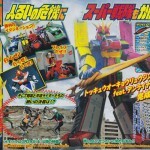 Tokunation › Super Sentai › ToQGer Special Movie Combo featuring Gabutyra & Den-Liner Resshas Revealed! ToQGer Special Movie Combo featuring Gabutyra & Den-Liner Resshas Revealed! The combinations’ official name is “ToQOh Kyoryuzin, Featuring Den-Liner!” This Mecha will be piloted through a joint effort of Kyoryu Red, Den-O Sword Form and the ToQGers! As of this writing the Go-Buster Ace Ressha also seen in toy scans does not appear to contribute to this movie combination. Perhaps the G0-Busters have once again been left out in the cold. We will find out full details in the “Hesei VS Showa: Featuring Super Sentai” Movie War, premiering March 29! But that is a new image. 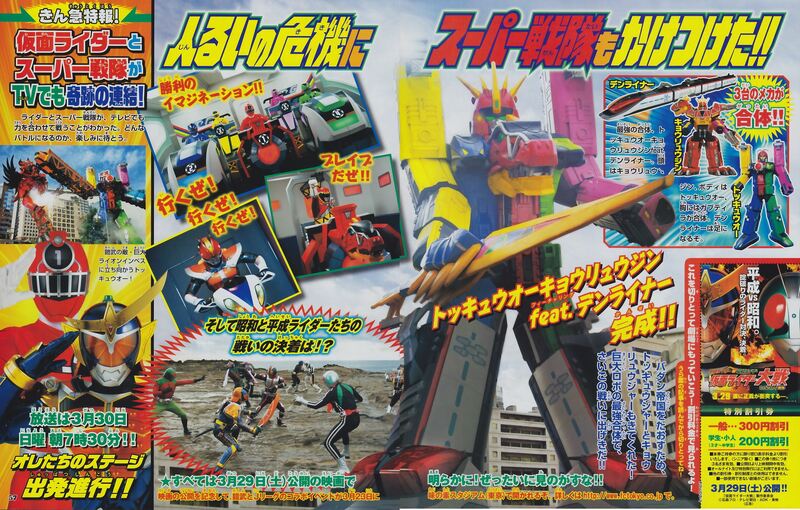 ... And now I need a ToQ-Oh.. Onore-Bandai. And they combines in the movie. That makes two of us. Just had to make a dinosaur train. That Gabutyra Train is super cute... I want one. I'm not buying a damn thing because I still don't like Gabutyra, but it makes me curious over others now.